In the previous post in this series, I added preamps and an echo/delay to a number of new and old percussion instruments. I could have left it at that, but I decided before finishing the project that one more refinement would add something significant to the value of these devices. 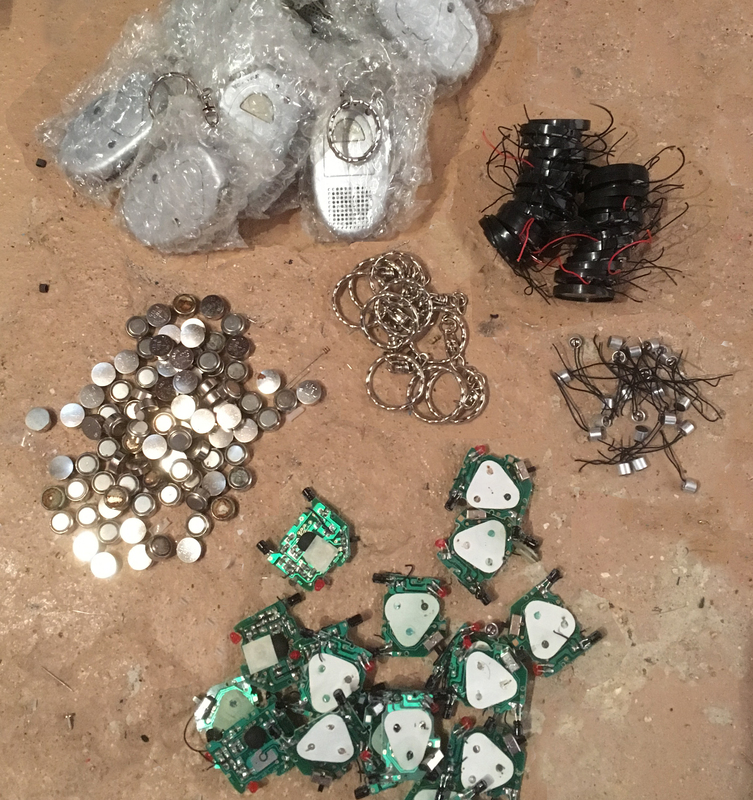 They were not guaranteed to work, but experiments showed that what mostly seemed to be wrong with them was that the batteries had run down – in fact, when I examined the box that I kept them in recently, quite a lot of them were leaking and spoiling the plastic cases. However, there was no reason to think that the circuit boards inside were damaged. In fact, a few years ago, shortly after I bought them, I’d successfully used a couple of boards – without really looking into their function fully – in a circuit-bent instrument which I called the StyloSound. 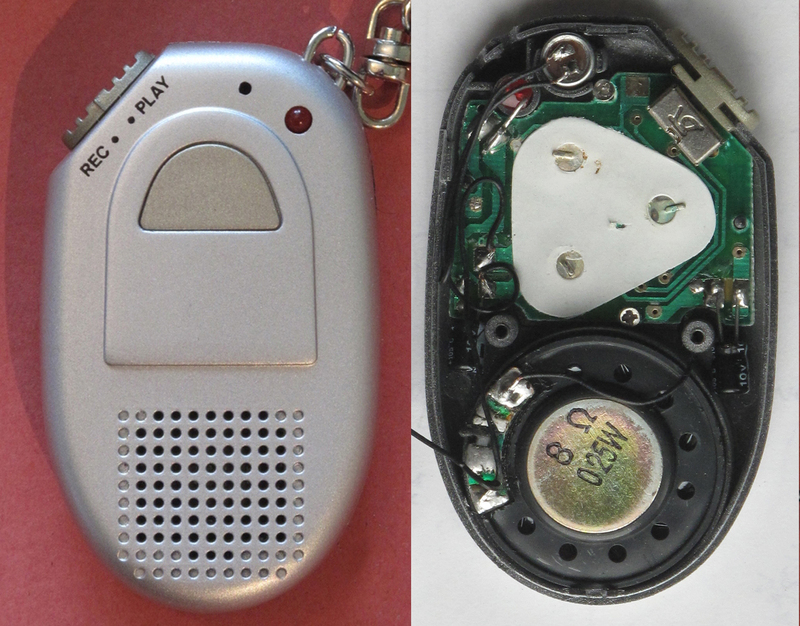 Clockwise from the top can be seen: complete units in good condition (batteries apart); small 8ohm speakers; small 6.5mm electret elements; intact circuit boards; discharged AG13 coin batteries; key rings. Some of these items would be of use in this project. 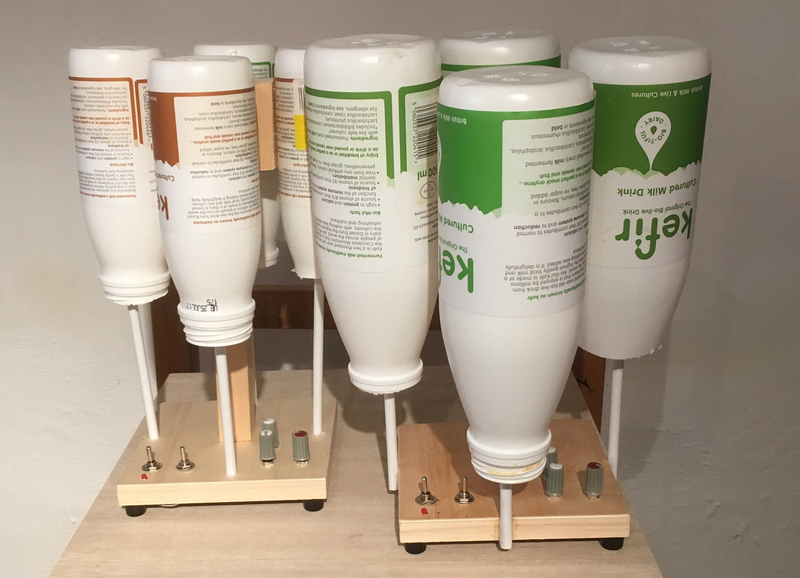 I have already described in the earlier post referred to above, using the electrets in constructing percussion instruments with plastic bottles; I was now hoping to use the circuit boards in all the instruments to give them a recording and looping function. In the top picture below, the main chip can be seen – or, rather, can’t be seen, as it’s hidden under the black blob in the centre. Above the chip are the two tracks which were beneath the record/play button; and in the top left the switch which selects between these two functions. I didn’t intend to use the selector switch, but two buttons, one side connected to the ‘rec’ side of that switch in one case, and the ‘play’ side in the other, and the other side connected to the large track, should do the job. 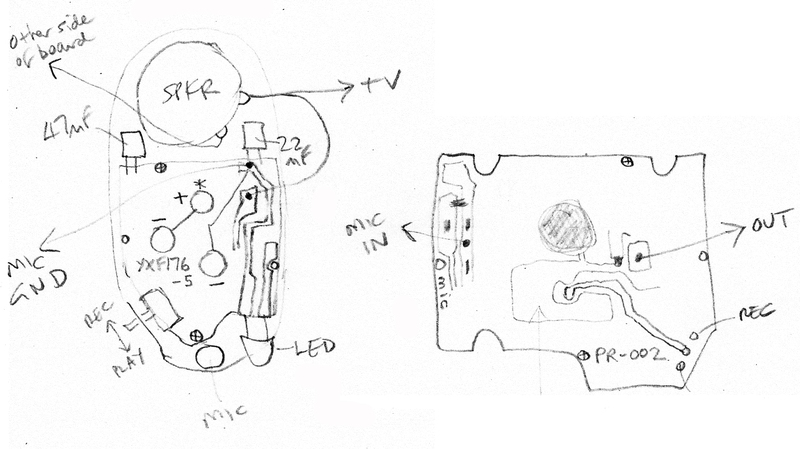 In both pictures the LED is visible on the opposite side to the ‘Play’/’Rec’ switch. This is connected to light up when the ‘Record’ button is pressed. 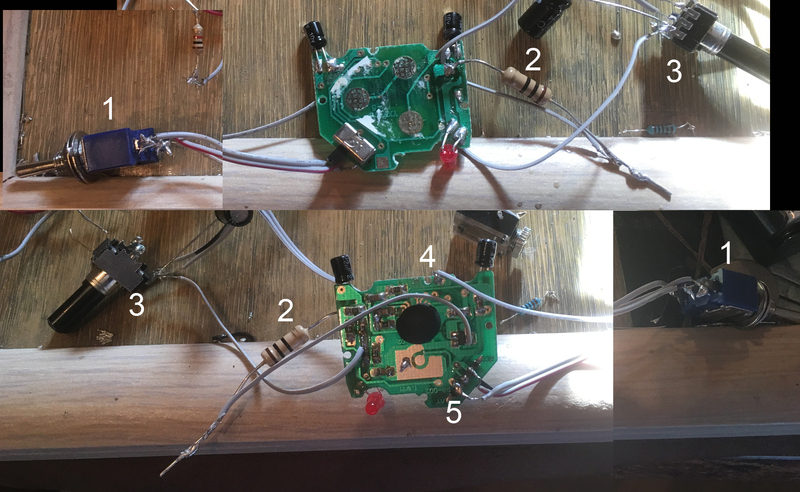 I also made sure to make notes of connections to the board before removing external components. As it was under a protective blob, it was impossible to say which chip it was which was employed in this circuit. However, it was quite possibly one of the ISD1800 series – in particular the ISD1820, about which there is quite a lot of information on the internet (for example here and here), and using which there are quite a number of modules available. These are very reasonably priced at £1 or less – although not nearly as cheap as my voice recorder boards, as long as I could get them to work in the way I wanted. 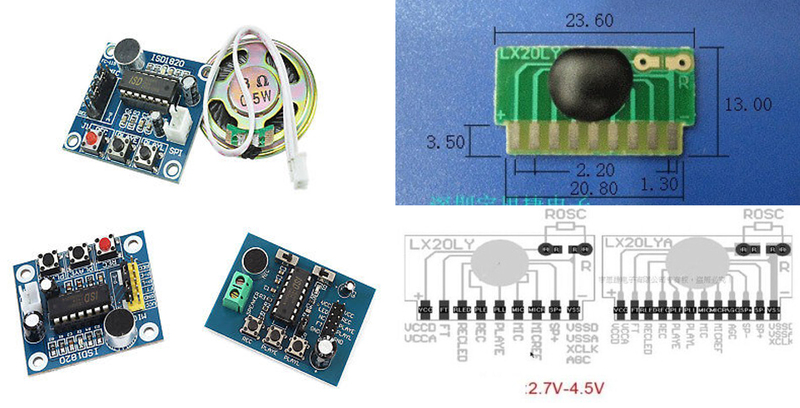 Note in the picture above that, although the ISD1820 is usually shown as a 16-pin DIL chip, the modules on the right use a smaller, concealed version, so I thought at first this might be the one on the voice recorder boards I was proposing to use. One of the features of the ISD1820 is that it has two methods of playback. In one case it will play a recording as long as the ‘Play’ button is pressed – in the same way as it will make a recording as long as the ‘Record’ button is pressed; but in the other, as soon as the ‘Play’ button is pressed, the recording will play through to the end, even if the button is immediately released. Pressing ‘Play’ once on these devices I had was enough to cause the recording to play through to the end, which is what I had hoped. However, this wasn’t everything I was looking for. In the StyloSound, the ‘Play’ button needs to be pressed every time playback of the recorded sound is required. Although this is suitable for the StyloSound, it isn’t proper looping, where the sound will be repeated indefinitely. The ISD1820 has a method of triggering repeats, and I was hoping I would find a way of doing this in a similar way with the boards I had. In the ISD1820 looping is achieved by linking the pin that lights up the LED to the ‘Play’ button. I was hoping this would be the case with these boards. 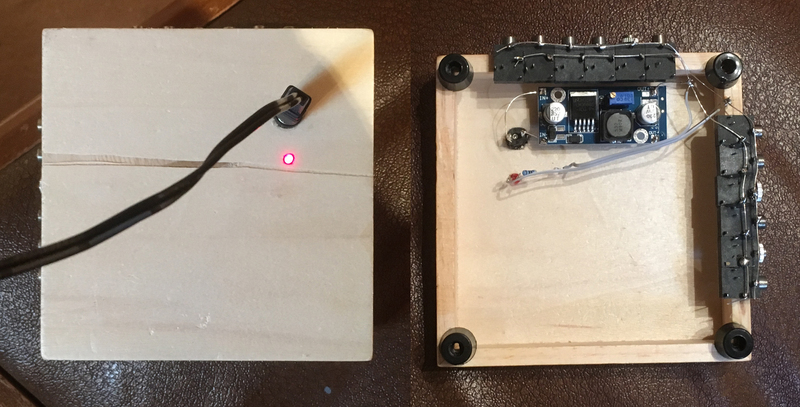 First I connected the power, audio in and out sockets, and ‘Play’ and ‘Record’ buttons – one side to the points each side of the switch, the other side to the large track above the blob – to check that the board was functioning correctly. The recording quality wasn’t that great, but it recorded and played back without problems. I then connected the ‘Play’ button to the LED connection – but no luck, it didn’t cause the recording to repeat: so I got out my multi-meter and connected one side to 0v pressing the ‘Play’ button and testing with the other side to try and find a point on the board which would be at a high voltage while the recording was playing and then went low as soon as it had finished – this high-to-low change being the thing which would trigger the recording to start playback again. I found a spot, and connected this to the ‘Play’ button, made a new recording and pressed ‘Play’. This time the recording played and repeated continuously. 1 is the ‘Record’/’Play’ switch. To conserve space, I decided to use a special switch which I had a small bag of. This was a 3-way SPDT toggle, one way for ‘Record’, the other way for ‘Play’, with a centre off position. 2 is a 10 ohm resistor, connecting the output to +v. I remembered that I’d had problems with the output of the board when I used it in the Stylosound, and this was the same – when I connected the board to the input of the TL072 mixer, there was no output. I reasoned, in the light of further experience, that this could have been that the circuit required a load to compensate for the speaker which had been removed. 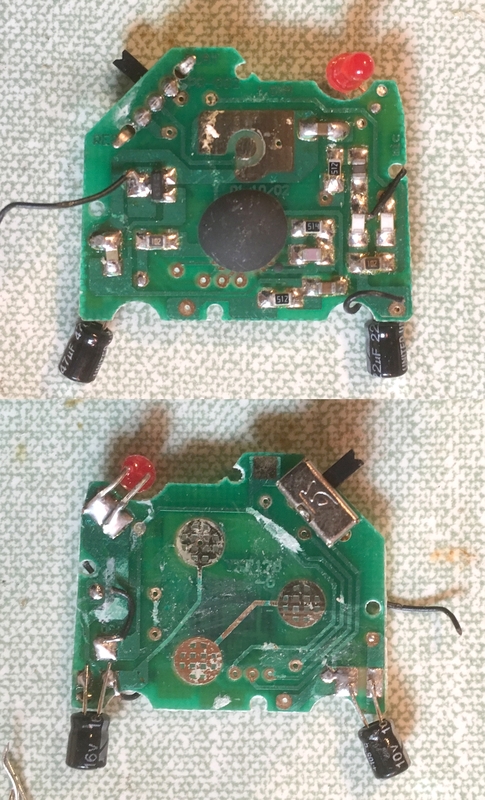 The speaker was 8 ohms, so I connected a 10 ohm resistor in its place. Sure enough, the output came through loud and clear . . . even though the output of the board wasn’t even connected to the mixer! I have no idea why this happened, but it did. It worked, so I didn’t look into it any further. 3 is a 10k volume control I added to the output of the mixer. Like most of the pots in this project, it was salvaged from the PCBs of some supposedly non-working mixers I had bought as a job lot from eBay (previously described here). As with the voice recorders, some of them worked fine, or had minor faults, but a couple of them were good only for parts. 4 is the new connection point for the looping function. 5 are the connections for ‘Record’ and ‘Play’. After these pictures were taken I also removed the LED from the board, and attached it with longer wires, so that it could be mounted beside the new ‘Record’/’Play’ switch. Finally it was time to finish these instruments off. The electret instruments proved to be slightly more complicated. Firstly. I had to add a TL072 mixer, as described in the previous post in this series, but also I needed to use the other half of the TL072 – which is a dual op amp – to double the output from the electret preamp. The layout of this circuit was exactly the same as the mixer, except that it had a single input, from the output of the electret preamp, via a 100k resistor, and the resistance between the input and output was 200k, amplifying the input by 2. To save space, I didn’t use pieces of strip board, I just added the appropriate resistors to 8-pin ic sockets for each of the instruments into which the TL072’s were plugged. 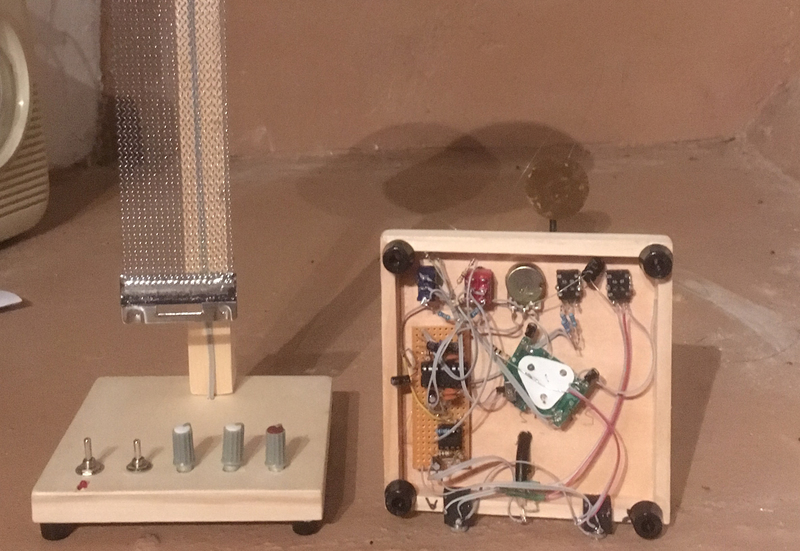 A 1M resistor was needed between the output of the PT2399 and the input of the mixer to balance the level with the output of the electret amplifier, which, as with the piezo circuits, used a resistance of 100k. The echo seemed quite good, although by no means noise-free; the looper was less effective. The straightforward amplified sound was excellent in each case; the degree to which the extra circuits were practical or useful varied from one instrument to another. For a further use of piezo elements as a pickup – in this case a hydrophone for underwater recording – see Pt. 7 of this series.